Too many friends and family members have been affected by this disease. 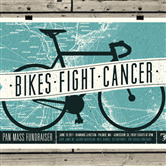 Please join me in the fight against cancer by donating towards my 2 day ride from Wellesley to Ptown. Any amount is greatly appreciated and will help me reach my fundraising goal.